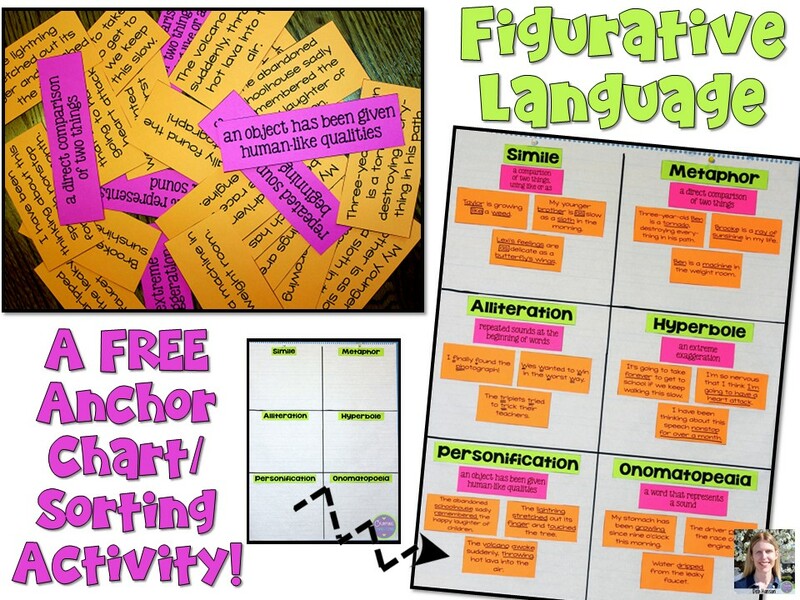 Today's figurative language anchor chart is a little different than most of my other anchor charts because it is completely interactive, and it actually involves a cooperative activity. 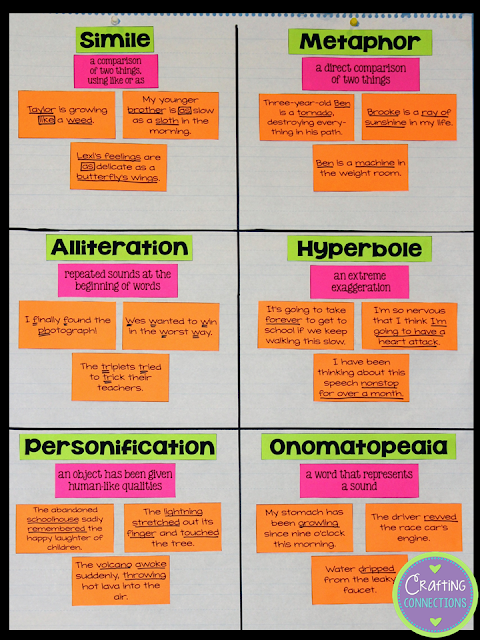 Also, you can download the materials and recreate this figurative language chart yourself!! I would use this anchor chart as a cooperative test prep activity, when students have already studied each type of figurative language in-depth earlier in the school year. 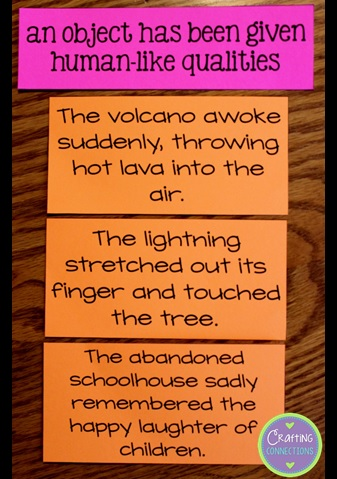 On standardized tests that I have viewed, students are given a sentence, a stanza, or a paragraph, and are asked to identify the literary device used within that piece of writing. This is entirely different from writing your own example sentence containing a given literary device, and I have witnessed students struggle with this type of test question. 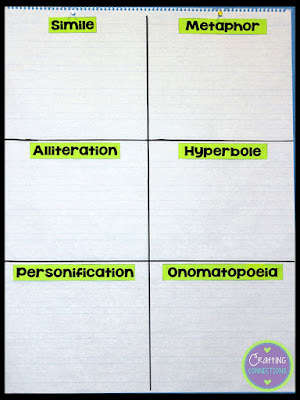 My hope is that by doing this type of figurative language analysis as a cooperative activity, students will be better prepared to analyze a sentence for a literary device independently. To prepare this activity (download here), I printed the first page- the literary device terms- in lime green. I printed the second page- the definitions- on pink paper, and I printed the final three pages- the examples embedded in sentences- on orange paper. Then I cut out all of the pieces. I glue the terms on my chart paper prior to the start of class. At the beginning of class, I pass out the remaining cards with the example sentences and the terms, one to each student. I explain that they must walk around the room, looking for their three partners. When they approach a potential partner, they must first exchange their cards without saying anything and read the sentence (or definition that was handed to them). After both partners have finished reading, only then can they discuss whether their cards are part of the same group. (I am hoping that the reading-before-talking requirement will force everyone to be actively engaged and fully participating.) Also, I require both students to make a comment before they move on. Eventually, students will be gathered in groups of four, with one definition & three examples. Finally, groups take turns coming to the front of the room, placing their cards under the document camera, and naming their literary device. At this time, I also ask students to underline the words in the sentences that is a type of figurative language. After a group is done presenting, we tape the cards to the appropriate area of the anchor chart, and then it's another group's turn to present. Ultimately, the anchor chart looks like this! 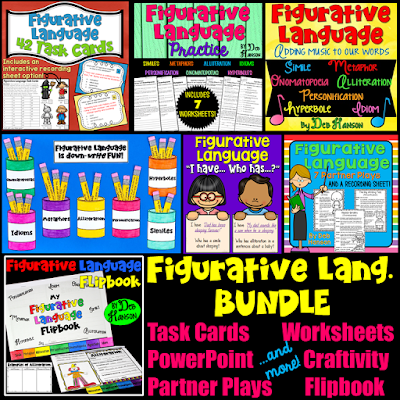 If you are looking for additional figurative language activities, feel free to check out my TpT store! This HUGE bundle is available to purchase, or you can buy individual items. I love the colors and way this chart is organized. Thanks for sharing! Thanks for giving me everything I need to recreate this awesome anchor chart! This is a great idea! I feel like a failure because my anchor chart writing isn't all that pretty LOL! Brilliant! We will be doing this one this week! Thank you so much for sharing your great ideas and awesome resources (and fo' free?!??!.... you are too kind)! This is a totally cute idea! I love it. And you are absolutely right- tests require students to identify what figurative language is being used. Thanks for sharing this idea with us!! Thank you for the freebie! I'm going to use it for end-of-year review. What a wonderful twist on an anchor chart! Perfect review for my lesson. Thank you.